With vehicle travel, it’s often a problem trying to find out how to power or charge all of your devices. A lot of electronics require an electrical outlet, and for the most part cars don’t include this functionality. 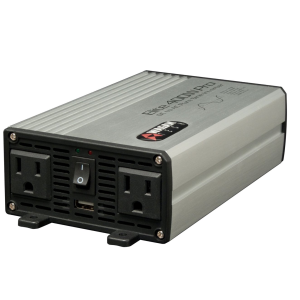 Fortunately, things like portable power inverters exist, where you can convert your car’s DC power source into AC power, allowing you to plug in nearly anything you want. The Wagan EL2601 Elite is something that not only allows you to plug in your devices, but it also has the characteristic of emitting a pure sine wave, making its power output much more stable than other inverters. It’s also fairly small and light, allowing you to store or mount it in a discreet location inside your vehicle. Topping it all off, it’s great if you happen to be budget-conscious as well. This Wagan model has a continuous power output of 400 watts and surge output approaching 800 watts, allowing to work with quite a number of electronics. More power-intensive devices, like gaming laptops and the like, may brush up against this limit depending on what you’re doing. Computers are becoming increasingly power-efficient anyway, but it’s something to consider if you want to plug in a computer that has a lot of horsepower behind it. That said, at its low price, it’s clear that this inverter wasn’t really made to power some of the heavier electronics out there. It’s great for charging your devices, powering non-gaming laptops, and running small appliances, but don’t get the impression that it can handle absolutely everything. As mentioned, an important feature of this inverter is that it emits a pure sine wave, allowing its power output to remain stable. A lot of other inverters, usually the cheaper ones, try to approximate a sine wave, making its power output a little shaky. This may not matter in some cases, but for more sensitive electronics like computers or TVs, it can make a huge difference in how the device functions or performs. Also included are mounting brackets, making the placement of the inverter a little easier. Combined with the small size, there should be no issue with putting it in a good spot. One of the biggest upsides of this inverter is that it’s fairly cheap. For pure sine wave inverters, it’s just about at the lowest end of the price spectrum. For inverters in general, it’s an extremely reasonable price for what you get. It’s not going to break the bank! With its small size, reasonable price, and versatile mounting and placement options, it’s one of the best inverters you can buy in the $100 range. If you travel a lot, it can also start to pay for itself compared to running your electronics at home all the time; no money added to your electricity bill! And best of all, its stable power output makes it ideal for all kinds of sensitive electronics. Overall, it’s a very safe purchase that works as advertised. As such, it gets a rating of 4 out of 5 stars.